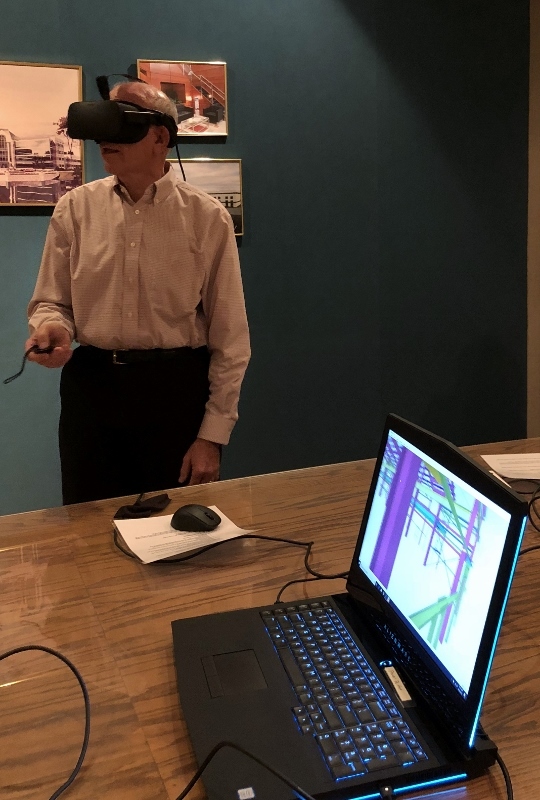 Nucor Building Systems’ District Sales Managers Trey Fox and Rob Simpson recently visited S. C. Hondros & Associates, Inc. to demonstrate their virtual reality presentation capabilities. Virtual reality provides a better sense of scale than on-screen and paper models, and impacts the way developers, contractors, sales people and clients interact with their building. Nucor Building Systems (NBS) generates a 3D model when quoting a project. These models can then be imported into 3D rendering programs like SketchUp or Oculus Rift to create a real-world experience before a building is even built. Using Oculus, a holographic model allows the viewer to virtually walk through a building and get multiple vantage points. As an Authorized Builder for NBS, S. C. Hondros & Associates, Inc. is able to provide an economical building solution for a multitude of end uses. This added capability allows users to fully understand their building before it is out of the ground. Shown here, Sam Kleto, S. C. Hondros, President, uses headgear to tour a holographic model.